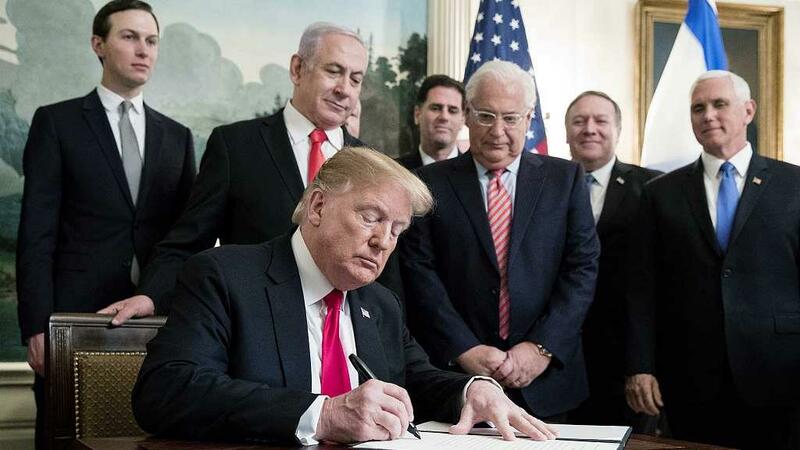 WASHINGTON, March 25 (CGTN) -- U.S. President Donald Trump on Monday recognized Israel's 1981 annexation of the Golan Heights in an election boost for visiting Israeli Prime Minister Benjamin Netanyahu, prompting a sharp response from Syria, which once held the strategic land. In signing the proclamation, Trump said: "This was a long time in the making." At the United Nations, Secretary-General Antonio Guterres is “clear that the status of Golan has not changed,” U.N. spokesman Stephane Dujarric said. “The UN's policy on Golan is reflected in the relevant resolutions of the Security Council and that policy has not changed,” Dujarric said. A UN Security Council resolution adopted unanimously by the 15-member body in 1981 declared that Israel's “decision to impose its laws, jurisdiction and administration in the occupied Syrian Golan Heights is null and void and without international legal effect.” It also demanded Israel rescind its decision. "The presidency reaffirmed that sovereignty is not decided by either the US or Israel no matter how long the occupation lasts," the statement said. With election day approaching, opinion polls put Netanyahu's right-wing Likud and Gantz's centrist Blue and White party neck and neck.